I was first published when I was 12 years old in a national anthology of literature for my age group, and I've been writing ever since. To say you're born to write is a bit dramatic, but I've spent a lifetime believing that and wanting to live out that prophecy with newspaper reporting and magazine jobs, freelance assignments and, finally, with my books being published by a New York house. My career has been blessed with good timing, good luck and ample energy to create what was needed when opportunity came. It also helped immensely that my genre of the past 15 years, narrative true crime, has been in high demand. This choice has obviously been challenging, but I have had a dynamic life because of it. Writing and music were lifelong passions, which I never ignored, but my family came first. My late husband, David Brotemarkle, had commendable careers in the military, teaching and helping to create Space TEC at Cape Canaveral. My daughter, Belle, is a Volusia County judge, and my son, Dr. Ben Brotemarkle is Director of the Florida Historical Society in Cocoa Village. I believe my children realize my guidance and support helped them accomplish their goals, but in such a competitive, achieving family I earned respect of a different kind when I began having successful books published after the age of 55. In this euphoric state, I could clearly hear my mother's words, "If it is to be, it's up to me." It's fun to get compliments and recognition of your work from others, but the self-appreciation that comes with personal accomplishment is the dearest thing of all. Regardless of how many books you have published, nothing compares to the thrill of seeing your first book up front and center in a major bookstore. Many know the profound feeling of holding a first-born child (an exaggeration, of course), and if it turns out to be a success, well, how proud you are. The only thing I didn't like was the face. My cover was chosen by the publisher for shock appeal that boosts sales. But in this case, I tried to develop the personality. That must have happened because "Blind Fury" ultimately received seven mass media printings. "Blind Fury," published by Kensington in 1993, was the story of serial killer Gerald Eugene Stano, who murdered 41 women in Central Florida. It had an initial printing of 100,000 mass media copies, and was distributed worldwide. It was selected as a "lead title" for Doubleday's True Crime Book Club, and was offered in hardback through color ads in Sunday newspapers and major magazines nationwide. Mystery Writers of America and Sisters in Crime panels at Stetson University, and for many other crime-related organizations. The promotional aspect was actually more demanding than researching and writing the book. In 1995, Kensington published my second mass media book, "Bound to Die," the story of Tampa Bay serial killer Bobby Joe Long, a case that still is considered a classic in outstanding police detection, before the use of DNA. Beyond the courtrooms and police precincts, research took me to the FBI crime lab in Washington, D.C., and to the FBI Behavioral and Profiling labs in Quantico, Va. This book was introduced at the Bouchercon Conference in Nottingham, England, and in London I was pleased to see it in the front window of Murder One bookstore on Charring Cross Road. 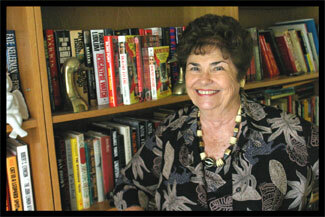 "Bound to Die" became a Mystery Guild book club selection, and was issued in hardback. It later received multiple mass media printings. A film studio came to my home in Satellite Beach to film my part in a segment of "Medical Detective" about the case called "Thread of Evidence," which was shown on the Discovery and Learning channels for five years. After that, I was interviewed live on more than 150 radio stations, and I never knew whether I would be talking for 15 minutes or an hour, or whether the subject would be on a specific case or on the criminal justice system in general. This was followed by call-in questions from listeners. My 1999 Raven Press book, "Murder at Wayside Antiques," was a departure from my serial-killer stories. It was a case of double-homicide in an antique shop north of Ocala. I discovered new readers from the antique world, and they invited me to speak at their National Convention of Antiques and Collectibles in Las Vegas. That night, I sold a record-breaking number for me of books at one signing. It was an unbelievable experience. Writing has made my life richer in so many ways. It's fun to be able to sometimes help new writers, as others have helped me. It's been rewarding to serve on committees such as the MWA Edgar Allan Poe Awards for the selection of best novel, presented each year at the Grand Hyatt Hotel in New York, and to receive other recognition and honors for doing something you enjoy immensely. I look to the future with great expectations.